Palestinian and international activists meet in Malaga. Photo credit: Al-Quds Association. Palestinian popular resistance activists meet with international solidarity groups. 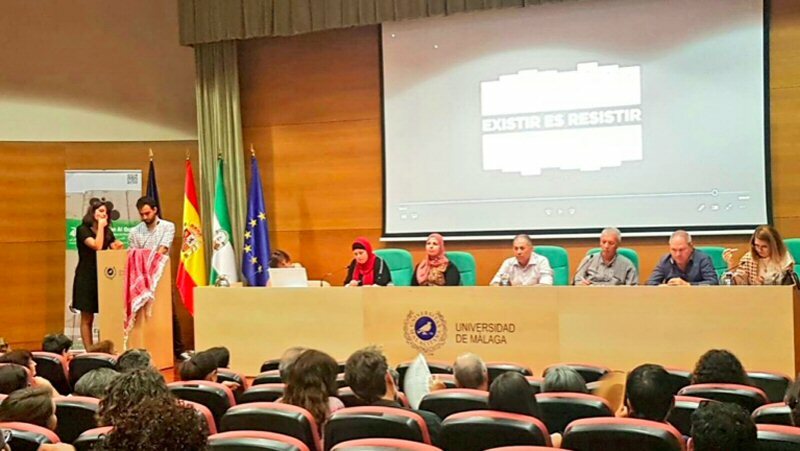 The Al-Quds Association and other Palestine solidarity groups hosted the Alternative Information Center (AIC) and activists from Palestinian popular resistance movements in Spain. The group held presentations in Malaga, Cardiz, Barcelona, Madrid, Valladolid and the Basque Country. The focal point of these events was the debut of the documentary film Existence is Resistance, produced by Al-Quds Association and AIC, along with the booklet Hebron: the Impossible City. The documentary screening was followed by productive discussions on the issue of Palestinian rights and the entrenchment of Israeli occupation. Participants discussed the Boycott, Divestment and Sanctions movement (BDS), the political situation, and new strategies to end the occupation in light of the failure of the Oslo Accords and the two state solution. Visitors from Palestine testified to escalated land confiscation and settlement expansion following US President Donald Trump’s decision to transfer the US Embassy from Tel Aviv to Jerusalem in violation of UN conventions and international law standards. Speakers emphasized the disastrous effects of the 11 year siege on the Gaza Strip and three Israeli attacks on the coastal enclave. The humanitarian situation is not only dire, participants agreed, but also lethal, especially considering the Israeli military’s policy to shoot and kill Palestinian demonstrators partaking in the Great Return March movement. The delegation raised these issues again when they met with the Flotilla to Gaza. Some members of parliament attended the discussions. The depth of discussion at these solidarity events was truly robust in these final ten days of June. Our partners in Spain imbued us with a new confidence in continuing our struggle and that we will be victorious in realizing Palestinian human rights one day. It was ten days of witnessing the warmth of international solidarity. It was ten days of serious and deep discussions about the Palestinians struggle with Spanish organizations, movements and activists. It was ten days of remarkable hospitality that made us feel as if we are with family. It was ten days that passed quickly, but will never forgotten. Most importantly, it was days of hard work for Palestine in Spain.